Chris Pratt is a television and movie actor best known for his roles in the television series Parks and Recreation (2009-2015), and the films The Lego Movie (2014), Guardians of the Galaxy (2014) and Jurassic World (2015). Chris Pratt's family tree stretches across both U.S. political parties with a kinship to Republican Mitt Romney and Democrat Hillary Clinton. He also has some circus blood in his family with connections to P.T. Barnum and one of Barnum's star performers General Tom Thumb. 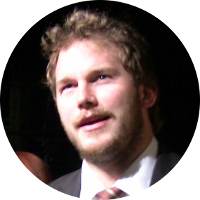 With the exception of Hillary Clinton, Chris Pratt's connections to the others are all through a common ancestor of Thomas Sherwood. Clifton C. Pratt is the great-grandfather of actor Chris Pratt. Clifton is usually found as the son of George W. Pratt and Margaret J. Lamphere in online genealogies. However Clifton does not appear in the 1880 census with the family when he was only a year old. I find it hard to believe that a 1 year old baby would not be found with his mother when his other siblings are found in the household. A search of eligible Pratt families in the 1880 census reveals only one candidate likely to be Clifton Pratt. George and Margaret Pratt's nephew Herbert Pratt, son of Percival Pratt, is found in the 1880 census living nearby with his wife Clara Harmon and a one year old son who is listed simply as “baby.” Clara Harmon is the sister of Mellen Harmon, son-in-law of George and Margaret Pratt. I believe Clifton Pratt may be the son of Herbert Pratt and Clara Harmon. Clara appears to have died while Clifton was young as Herbert Pratt remarried in 1892. It's possible that Clifton went to live with other family members causing confusion with his parentage. Further research is needed to positively identify Clifton's parents. In either scenario, Clifton Pratt would still be a descendant of Stephen Pratt and Anna Jones, and therefore, so would Chris Pratt. Rhoda Sherwood is the 5th great-grandmother of Chris Pratt. She also is the granddaughter of Isaac Sherwood and Mary Hayes. Her father is thought to be Isaac's son Samuel Sherwood and his wife Martha Ketchum, but I have found no evidence to confirm this. Isaac and Mary Sherwood had more than one son and evidence is needed to prove which of their sons is the father of Rhoda Sherwood. Perhaps a will or bible record can be found to identify which son is her father.